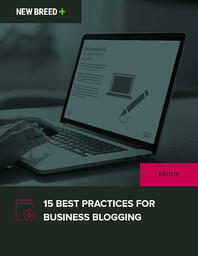 Download: 15 Best Practices for Business Blogging! Our guide will walk you through the steps to take when building a business blog that drives competitive results. Learn how to align your content with your audience to effectively engage your readers, use your blog for lead generation and to build a strong online presence, and create a process to stay frequent and consistent with your content. great way to generate qualified traffic to your website and fill the top of your sales funnel. into customers. HubSpot found that 57% of companies that publish a business blog acquire a customer through a blog-generated lead – a business that blogs at least 20 times a month generates nearly 4 times more leads than those that don’t blog. To download, fill out the form to the right!